Robin Beck is a singer that probably everyone in the US and Europe has listened to at least once whether they realise it or not - her hit 'First time' was used in a Coke advert and got to number one in the charts as a result. 'Underneath' is her ninth album (tenth if you include the 2009 re-recorded version of 'Trouble or nothing'). 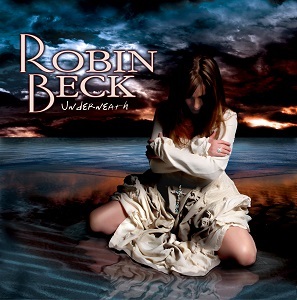 I really enjoyed Robin Beck's last album (2011's The Great Escape), so was looking forward to hearing this new album, to see if it would live up to the high standard of that album. Well after a couple of listens I can tell you that it's even better than 'The great escape' - in fact it's a fantastic album. The album kicks off with 'Wrecking ball'. What can I say other than WOW. This track is stunningly good - in fact the first time I heard it was enough to persuade me that I need to buy a copy of the album. It's a song that deserves to be released as a single and if there's any justice it would top the charts. 'Catfight' is another great track. It's got a slight Shania Twain feel to it. 'Burnin me down' starts off with Robin singing with just the piano for accompaniment before the band joins in later in the song. It's a slower song and yet another great track on the album. 'Perfect storm' features a nice guitar solo. If you're a fan of AOR or melodic rock then this album is one that you should definitely check out - it's a great album and one of my favourite albums of the year so far (and that's against some very stiff competition).